Upper Slaughter sits astride the Rive Eye, three miles south-west of Stow on the Wold and two miles north-west of Bourton on the Water. The name, Slaughter, is derived from the old Saxon word, Slohtre, meaning a muddy place, but don’t let this put you off! It is a truly wonderful Cotswold village that remains totally unspoilt. As well as The Square, there is a Manor House (now the Lords of the Manor hotel), Old School House, tiny Chapel, Village Hall and the Parish Church of St Peter, which dates back to Richard the Lionheart's reign. There was once a castle, but now all you can see are the remains of the motte and bailey. The local towns of Stow on the Wold and Bourton on the Water provide the essentials: supermarkets, banks, post office, leisure facilities and garage, as well as a wealth of independent shops, cafes, pubs, antique centres and galleries. 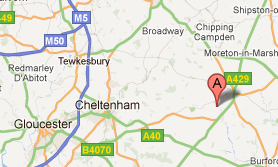 For a larger centre, Cheltenham is just 18 miles away. There is an abundance of fantastic places to visit in the local area: wonderful village pubs, incredible stately homes, farm shops, family days out, etc. Whatever you are looking for we are confident you will find it, practically on your doorstep. There is also an extensive network of walks and cycle routes, with Upper Slaughter joining the Gloucestershire Way, Monarch’s Way, Macmillan Way and the Heart of England Way. An information pack* is available in the property detailing local amenities and places of interest. If you are doing some research before you arrive then try: www.lovingthecotswolds.com. The tourist information centers in Stow on the Wold and Bourton on the Water are also excellent. *We are happy to ‘tailor’ your information pack to your specific needs/interests - please let us know in advance if there is anything you are particularly interested in so that we can put this together before you arrive.